Although there are slightly supernatural elements to the narrative, much of Solace is a by-the-numbers serial killer film. There are serious well-meaning law enforcement agents, a sadistic killer who believes his murders are somehow justified and possibly even righteous, all leading to an inevitable showdown between good and evil. There is very little that is new to be found in Solace, often so derivatively similar to a slew of the same movies that followed the success of David Fincher’s Se7en that one might be mistaken in thinking it was made in the 1990s if it weren’t for the age of the recognizable cast members. 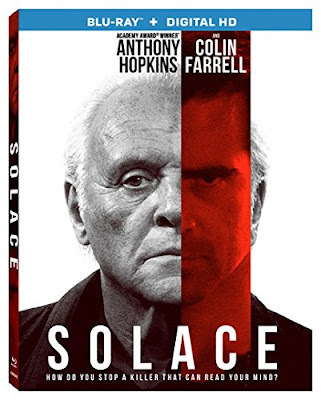 With a set-up that sounds like the beginning of any number of recent police procedural television shows, Solace begins with FBI agent Joe Merriwether (Jeffrey Dean Morgan) and his new partner (Abbie Cornish) approaching a reclusive psychic named John Clancy (Anthony Hopkins) to help solve a series of murders. The serial killer in question leaves behind bodies with only a single wound as his mark, and further investigation proves that they may even be mercy killings of some type. After a few obligatory scenes of Clancy insisting that he has retired from this type of work, he inevitably agrees to help, only to discover that he may have something in common with the killer. Although Clancy’s psychic gift plays heavily into the narrative, the true enjoyment of the film comes from far more typical sequences, including chases and shootouts. Rather than providing audiences with one big mystery, such as the identity of the killer or his motives, Solace instead doles out minor ones throughout the film, leaving very little for the climactic ending. Although one of these mysteries is indeed the killer’s identity, any knowledge of Colin Farrell being listed as a cast member will likely spoil this long before he arrives onscreen. There is nothing inherently awful about Solace, despite poor reviews. Mostly, it just feels derivative and uninspired, but might make for a decent viewing if caught on television some lazy afternoon. Fans of Se7en may notice how much it feels like a poorly made rip-off, as it was actually created as an intended sequel (even originally titled Ei8ht, despite having no connection to the deadly sins) before Fincher expressed his disgust with the idea. It took several decades and being passed around from studio to studio, but this still feels like a mediocre copy of a much better film. The one saving grace is Hopkins, who is great even when he barely seems to be making an effort. The Blu-ray release for this thriller that whimpered its way into a release actually has a few decent special features. Along with a commentary track from Brazilian director Afonso Poyart, there is also brief making-of featurette (about 8-minutes long), and a trailer gallery for Lionsgate films.